Made in the USA, furniture frames are solid wood, Northern Soft Maple. Domestically produced, this wood is chosen for its fine hand finish and acceptance to virtually any stain. All pieces are hand dowelled; corner blocked and professionally finished by old world, furniture artisans. You may select from 6 wood finishes and choose upholstery nails in either brass or pewter. Select pockets on the jeans are left open for storing cell phones, iPods, remotes or personal belongings. Personalized embellishments, i.e. initial or personal design motifs are available in embroidery for an additional fee. 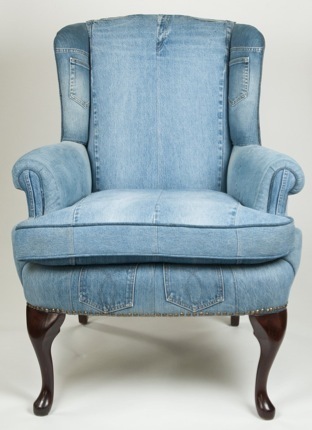 We will, upon special request, provide jeans to upholster a customer’s own piece of furniture. After a review of the size and condition of the piece, a custom price will be given. Each piece is made of original jean material and accessorized with crystals, lace, cotton, cashmere or faux fur. A window and/or pockets can be created to hold photographs, cell phones or personal mementos. Using your own jeans to commemorate life’s special moments (friendships, graduations, weddings, retirements … the occasions are limitless) is not only a wonderful way to recall precious memories, but is eco-friendly as well. Great care is taken in selecting the jeans used in each product. Since jeans vary greatly in color and the quality of fabric, those elements will be reflected in the character of each piece. We believe this only enhances the unique quality of each LegendBlues piece. When an order is placed, the client will be provided a sketch of specific embellishments, i.e. initials, embroidery, crystals, etc. for approval prior to fabrication. Once approved, delivery will take approximately 6-8 weeks for furniture and a minimum of 3 weeks for pillows. A 50% deposit is due at the time an order is placed and the remaining balance payable upon delivery. *Photos shown are prototypes of available frames.